I wanted to fit a function in the form of an integral with variable limits to a data set. Fo this, I made a code which first does the integration. 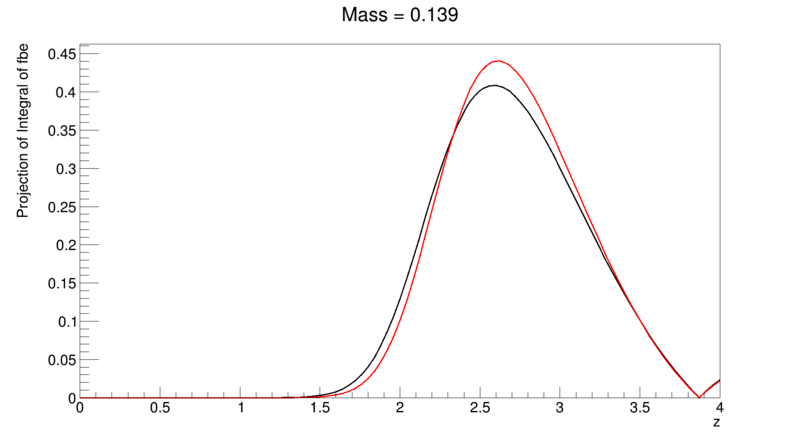 The integration works if Tmb and Tbe are constants . But I need to make them as a paramenter for the fit. Can you please tell me as to how I do that with the present form of my RooGenericPdf fmb and fbe ? I pasted the code above. Unless someone else jumps in, @StephanH will likely be able to help when he’s back at work in about two weeks! Set a default range for p. I.e., use p.setRange(min, max). When creating the integral, don’t specify a range. It should fall back to the default range now, and use a parametric binning. Try to fit and integrate. I tried to do p.setRange(min, max) followed by not specifying the range in the createIntegral() method. But the integration gives curve with strange and unexpected shape. [#0] ERROR:Plotting -- RooRealIntegral::fbe_Int[p]_Norm[p]:createPlotProjection: "c" is not a dependent and will be ignored. [#0] ERROR:Plotting -- RooRealIntegral::fmb_Int[p]_Norm[p]:createPlotProjection: "c" is not a dependent and will be ignored. Before fitting, I wanted to confirm that the integration is done correctly. Basically, what I want to do is three integrals. 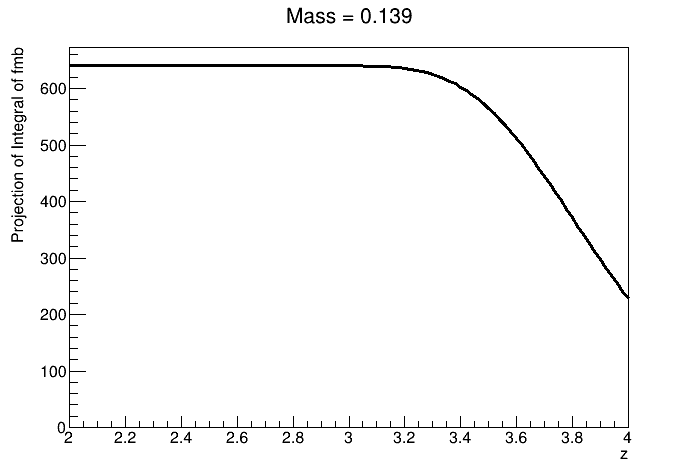 Integral [range: 0 to p(max) ] (f(E)p^2dp) with pmax = a function of ‘c’, which is the x axis of the distribution I want to fit it with( c ranges from 0,1). I made the first code in the thread for the third case. I am a bit confused with why the integration is not working at all now. If possible could you please suggest me some clear and correct way of doing it with root or roofit? in the code you pasted, RooFit doesn’t know what to integrate over. Specifically, fmb does not depend on ptSq. It’s like asking it to integrate f(x) * dy. That’s obviously constant. To demonstrate that it works, I decided to integrate over E instead. It works, and I am also able to change the integration range using z.
RooRealVar ptSq("ptSq", "ptSq", 0. ); // .. I hope that’s enough to set you on a path towards implementing all three steps. Thanks a lot for pointing out this foolish mistake of not changing the variables. I changed the form of equations appropriately and it gives the desired shape (at least) after the integration. The modified code and result is pasted below. technique for one of the integration, I mentioned above, I am getting a different than from roofit. I am cross checking it and I shall come up with some more details. I do hope that you will take a look at it. one thing I can tell you already now is that it’s almost sure that numerical integrations are being used. Therefore, depending on the method (and settings), you will get different results. Can you have a look at the terminal when the RooFit integration starts? Like this we would at least know which method it is using. In the end, it might just be a matter of precision (and therefore runtime) to get a decent result. If we don’t manage to have all methods converge to the same point, it’s a systematic uncertainty of your analysis. // for normalization integrals for MINUIT to succeed. and all of them gave me the expected results. So It was indeed a successful mission with those three integrations I mentioned. I am using my corresponding ROOT code only for fitting now as the fitted curves are not normalized to data points in the case of Roofit. I am still working on it. But it gave consistent parameter values as I compared them with the ROOT. The log of integration is as follows. In addition there were few mistakes in parenthesis which I missed while entering the expression to integrate. So the whole problem now has converged to normalizing the fitted curve to the data point in case of RooFit. But I successfully did it with ROOT macro. Thanks again for the valuable suggestions. It indeed helped me to solve some of my long running issues. Maybe the tutorial rf110 can help here. It explains the normalisation integrations for PDFs.